Cut onion in large pieces and crush garlic cloves. Place onion and garlic in a pan. Season chicken breasts with salt and pepper and place on top of onion and garlic. 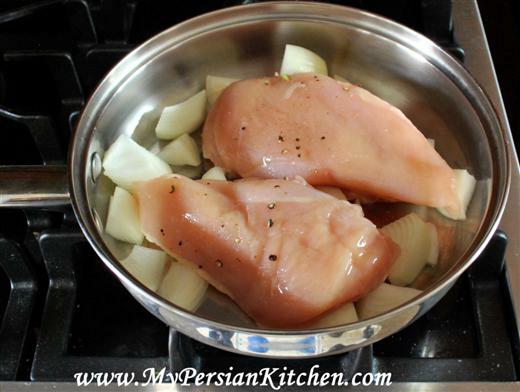 Add 1 cup of water, cover and cook for 20 minutes or until chicken is cooked through. 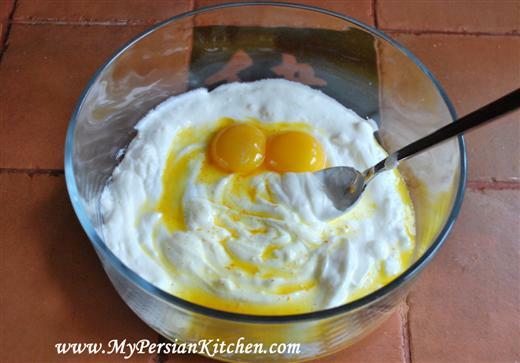 In the mean time mix yogurt, egg yolks and saffron together. Season with salt and pepper. Shred chicken in chunks with two forks. The pieces should not be too big or too small. 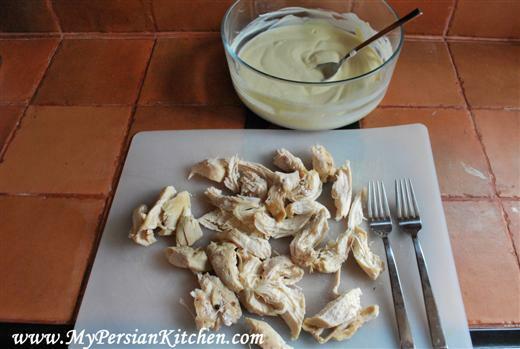 Add chicken to yogurt mix. Cover and refrigerate over night. Parboil rice according to directions in Cooking Rice For Polow post. Add rice to the remainder of the yogurt and mix well. Season with more salt if needed. Pour 2-3 tablespoons of oil in the bottom of a pirex dish. Spread the oil all over including the walls of the dish. Place half of the rice in the dish and make sure that it is all even. Arrange the chicken on top in a single layer. Add remainder of the rice on top and flatten the top slightly pressing down with a spatula. Melt the butter and pour over the rice. 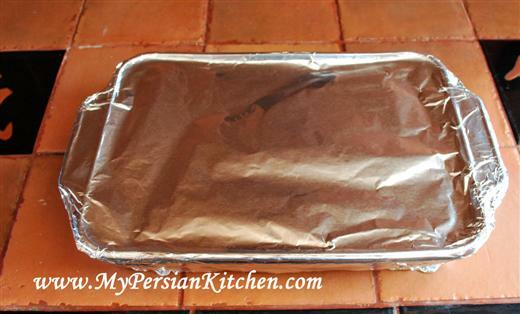 Cover the dish with foil and bake at 350° for 2 1/2 hours. Hmm….I have never made it with cooked marinated chicken. Doesn’t the chicken then just become super dry? Usually we marinate it and layer it on the bottom of the pan and after 1- 1/2 hours of cooking it’s all good. Marjan, noooo it was actually nice and moist because it stayed in yogurt the whole time. I also made sure not to over cook it initially. So you marinate the chicken raw in yogurt? This looks great and easy to do. I never prepared rice with yoghurt but will give a try. Wow, that is beautiful, and looks delicious! What vegetables would you recommend as a side dish? Yeay!!! Thanks for posting this, I will have to try it asap. It looks beautiful. @ Shahen, I have never made it before without egg yolks but I guess you could add a bit more saffron to it to compensate for the color. Let me know how it goes when you try it! This sounds yummy and actually like a dish my kids could enjoy. Will make it soon. Thanks for posting this. 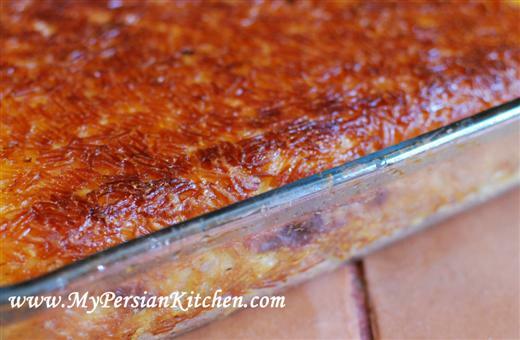 How did you get that golden tahdig on top? Do you keep the dish covered throughout the 2 1/2 hours of cooking time? @ Mahnaz, I flipped it and placed it back in the dish that I baked it in. @ Kolaleh, yes, I kept it covered for the entire time that it was in the oven. The crust that you see is the bottom which I flipped and placed back in the original dish. I’m very happy I found your blog, because I am married to an amazing Iranian man and would like to learn more recipes. 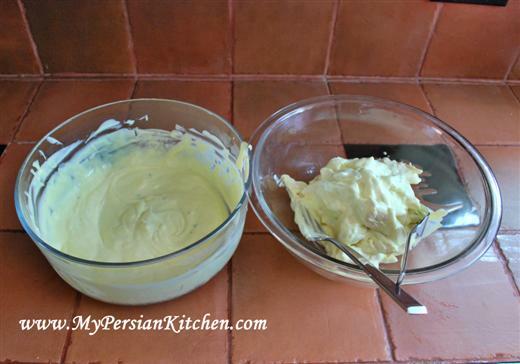 I have started Iranian cooking myself and post all amazing recipes from my mother in law on my own blog: http://eshgheman.livejournal.com. Now I wanted to write about Persian tea and from your entry I have found out about the rose petals… Nice touch. I will keep on reading your entries. Another question, when you flip it does it come out in one piece like a cake? Mahnaz, yes it comes out all in one piece. But you have to do it carefully. First you flip it onto a dish, then ever so carefully slide it back into the Pyrex. Can you substitute yogurt with something else? Marmar, good question. I had no idea until recently that you can omit yogurt in this dish. A Jewish friend said that she substitutes yogurt with lemon juice. I will ask her for th recipe and post it some time soon. looks delicious!! what size pirex dish did u use? I would love to make this dish for my boyfriend. It’s one of his favorites from his childhood. How do I prepare the rice? According to the polow or chelow instructions? Hi! I love your recipes!! I have an Iranian boyfriend and so far I have managed to cook a lot of persian dishes for him. He is very pleased with all the dishes I’ve cooked for him:D I’d like to try and make Tahcheen. However, it is ok if I do not marinate the chicken in the yogurt overnight? Reena, you can skip the marinating part. But honestly, it tastes much better when it’s been marinated!! Linda, good for you!!! It’s kinda hard to figure out the right amount of salt, but the more you make it the better you get at it! Fahad, Zereshk is added on top of this dish. Cook the rice according to this recipe’s directions. 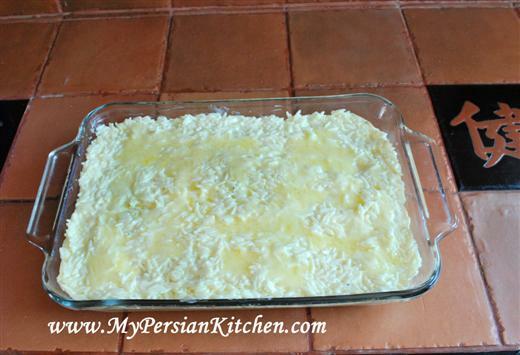 Once the rice is about 10 minutes from being ready melt some butter in a pan and add washed zereshk to it. Additionally, add some sugar and brewed saffron and mix well. Saute until sugar has dissolved and the zereshk has turned plump. 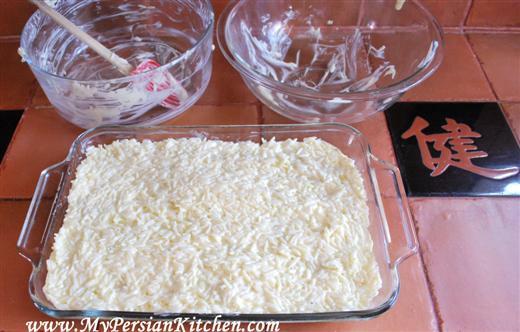 Once the rice has been put in a serving dish, then add the zereshk on top. This has to be my favorite dish at the moment. Thank you so much for sharing. thanks for the great recipe! my sister cooks a lot of persian food (and is married to a wonderful persian fellow) and this one is my favorite. she has made it with out mixing in the egg (as not everyone in the family can eat eggs) and it turned out great. Hello, I’m so happy I found this website. 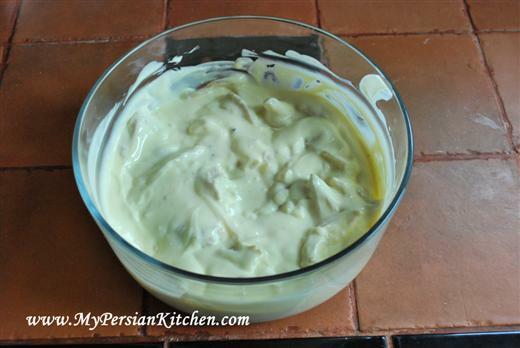 Tahcheen is one of my favorite dishes, but I had no idea how to make it. I followed your directions, but my rice didn’t turn out as yellow and it seems a little flakier than I remember it to be. Do you know what I may have done wrong? I’m assuming my saffron water had too much water and I may not have needed to use more yogurt (or less rice). Hi! 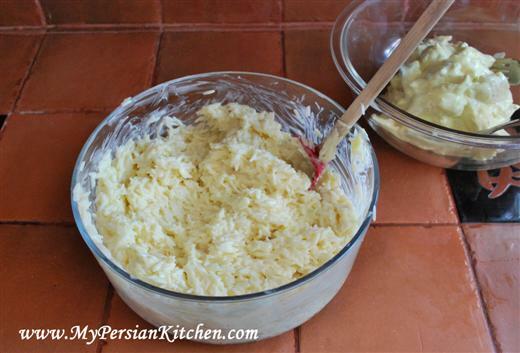 Thank you so much for your blog, I’m first generation Iranian- American and am always looking for recipes to make my favorite dishes I tried the tahcheen and it turned out a crumbly and dry. do you think i should have added more yogurt? and do you fully cook the chicken before u put it in the marinade? @Prusha, yes you probably needed more yogurt. Yes, the first thing that you have to do is cook the chicken fully. Neda, everything else gets discarded. We just used this recipe with a few adaptations. We used brown basmati rice and added Tepary beans that I bought from the Tohono O’odham while in Tucson last fall. It is so so good. yummy, thank you for sharing. I don’t have 2 1/2 hours, is there a chance to reduce the time by increasing the oven temperature, or ??? if yes, what temp? for how long? Thank you. Mina, I suppose you can. I would not go over 400 degrees though as you’d risk burning the food. I would go about an hour. Your recipe was fantastic!i made this today for lunch, and although my Pyrex dish was circular and smaller, the tahcheen came out perfectly!I hadn’t had a tahcheen like this for so long! thanks! Hello! I am extremely eager to make your tahcheen. I have a question which might sound stupid but when you say to bake it at 350° F is this for a conventional oven or for a fan-forced one? Thanks! a regular oven which is what I have. We had a food competition in our company(based in Sydney) and I made this dish and got compliments on it. My first time making this and it turned out perfectly. Thanks so much!!! 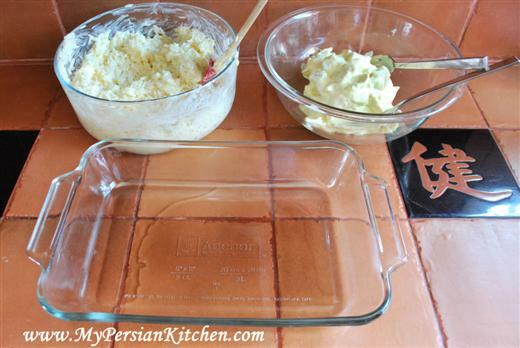 I would like to put the zereshk in with the rice and chicken to bake in the oven. Should I do this when I mix the rice with the yogurt? I have had it prepared in a pot like this, but I like the look of the oven version. I am going to make this for dinner today. Can’t wait. 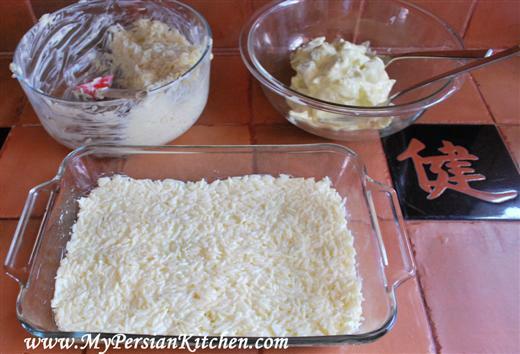 Susan, yes, you can mix the zereshk in the rice before baking if you wish. Most people prepare it on side and add it on top when serving. Just wanted to let you know that my Tahcheen came out fabulous thanks to your wonderful directions. My family has a new favorite. I did reserve some of the zereshk to decorate the top and it looked like a restaurant dish. I just adore your site and your stories. 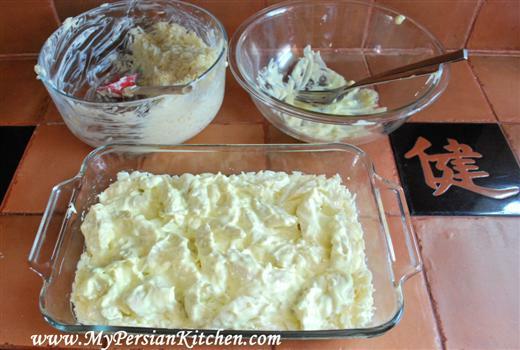 I have become a great persian cook because of you. Thank you. All the best to you and the sous chef. Tonight it is baghali polow!! Susan, I am so glad to hear about your success in cooking Persian food! !